Another sign of hope: small papers still have a hold on classifieds. Average classified sales for small papers have actually gone up, at a time when they have been declining for most papers. Inland cites an example of a daily newspaper with a circulation of less than 15,000, which posted a 210.4% increase in classified revenue from 2004 to 2008. But it didn’t do much good. The paper’s profits were down by almost 30%. All in all, newspapers on average reported a 13.5% drop in ad sales between 2004 and 2008, which confirms yet once again the dismal state of the industry. Curiously, the study says that the largest newspapers reported an average profit margin of 12% in 2008, which is remarkably high for publishers whose profits have virtually disappeared. Mutter points out that a 12% profit margin is more than double Wal-Mart’s margins in 2008. 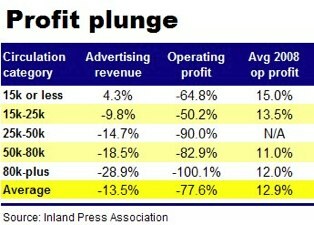 Apparently, Inland Press says the reason profit margins could still average 12% is because data was collected from a variety of publications, some of which had healthy margins and some of which has terrible losses. We’re not sure which, if any, large newspapers had healthy margins. Also, the data that was volunteered by publishers was released on condition of anonymity. Seems like a bit of a paradox in these times. Perhaps their are just averaging the profit margins across newspapers on a percentage basis, while taking absolute profits and losses into account when calculating the overall declines. Large percentage gains at small newspapers would then have an over-sized weighting. No matter how rosy a picture the newspaper association tries to paint, the fact remains that there are still serious (perhaps mortal) declines at all newspapers. And while death may be slower for the little guys, it’s still imminent.